The Green River Formation of Wyoming, Utah and Colorado preserves some of the most spectacular fish fossils, with over 1 million specimens collected so far. The deposits range in age from late Palaeocene to late Eocene (57-38 Myr ago). Many of the specimens are found in finely layered buff-coloured limestones that were laid down in three large inland lakes, Lake Gosiute, Lake Uinta and Fossil Lake (Grande, 2001). Lake Gosiute and Lake Uinta are interpreted as playa lakes, ephemeral salt-water bodies in a generally hot arid setting, whereas Fossil Lake seems to have been a more stable body of fresh water. Many of the fish may have been killed by annual anoxic events, as in the Old Red Sandstone lakes (see Box 3.4). The fish faunas (Grande, 2001) consist mainly of teleosts, such as the small herring Knightia, catfishes, suckers, perch, as well as the gar Lepisosteus, the bowfin Amia, the paddlefish Crossopholis and a stingray Heliobatis (see illustration). 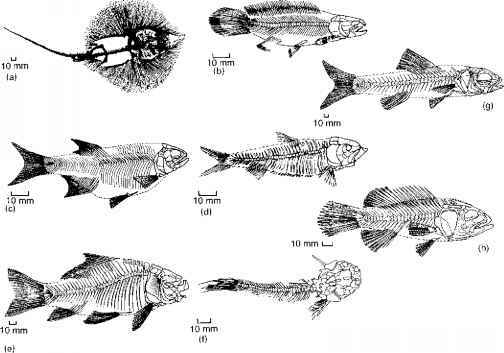 Grande (2001) records 27 species of bony fishes from the three main Green River lakes. Their distribution generally differs from lake to lake. For example, the gar Lepisosteus is very common at some localities (25-50% of all specimens), but extremely rare at others. Only Knightia is common or extremely common (5-50% or more of all specimens) at most localities. Other taxa are present in only one lake (e.g. suckers and catfishes from Lake Gosiute; hiodontids, paddlefish and stingrays from Fossil Lake). The fishes are associated with rich fossil remains of plants, insects, molluscs, turtles, crocodiles and other lake creatures. neoteleosts include the stomiiforms and the aulopi-forms (Figure 7.11(b)), mostly deep-sea fishes dating from the Cretaceous. Another basal neoteleostean group, the myctophiforms or lantern fishes, possess photophores, light-producing structures that show up when they descend into deep waters. These also are found in many stomiiforms. The remaining neoteleosts are termed the spiny teleosts, or acanthomorphs, because they bear stiff fin spines. These may be moved by muscles at the base, and they have a defensive function because they can be erected if the fish is threatened, effectively stopping it from being swallowed! The acanthomorphs show other derived features. The scales are spiny, the so-called ctenoid (i.e. 'comb') type. The body is short and relatively rigid, and the swimming thrust is produced by rapid movements of the tail fin instead of by bending the whole body. 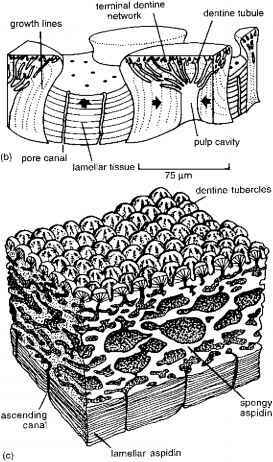 This allows great speeds to be achieved—as much as 70 km per hour in the tuna, compared with 10 km per hour in the trout. In addition the acanthomorphs have the toothed premaxilla type of jaw (see Box 7.4). Within the Acanthomorpha, the paracanthoptery-gians include some 250 genera of cod, haddock, anglerfishes and clingfishes, and date back to the Late Cretaceous (Figure 7.12(c)). The acanthoptery-gians contain 12,000 species that fall into two major groups, the atherinomorphs (1300 species) and the percomorphs. The atherinomorphs (killifishes, flying fishes, guppies) date from the Eocene to the present. The percomorphs (Johnson and Patterson, 1996) include a tremendous range of forms, from seahorses to flatfishes and from tunas to porcupine fishes. The group as a whole is known from the Late Cretaceous, with well preserved representatives in some Eocene fish beds (see Box 7.7), but most families have a very limited fossil record, often confined to the past 20 Myr or so. The polymixiiforms (Figure 7.12(d)) have deep bodies and the pelvic fin is below the pectoral fin. Fig. 7.13 Phylogenetic tree showing the radiations of the cartilaginous fishes (left) and the bony fishes (right). 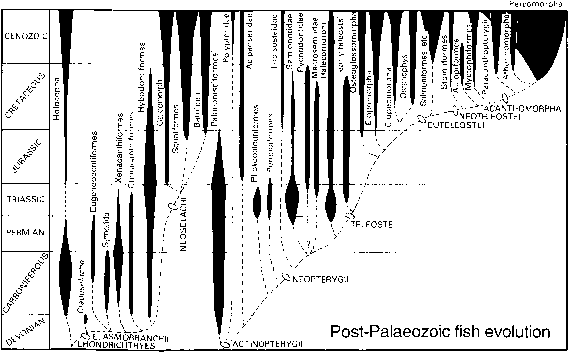 Postulated relationships, based on cladograms in Figure 7.7 and Box 7.6, are shown by dashed lines, the known fossil record by solid shading in the vertical dimension (time-scale on the left) and relative abundance by the width of the 'balloons'.